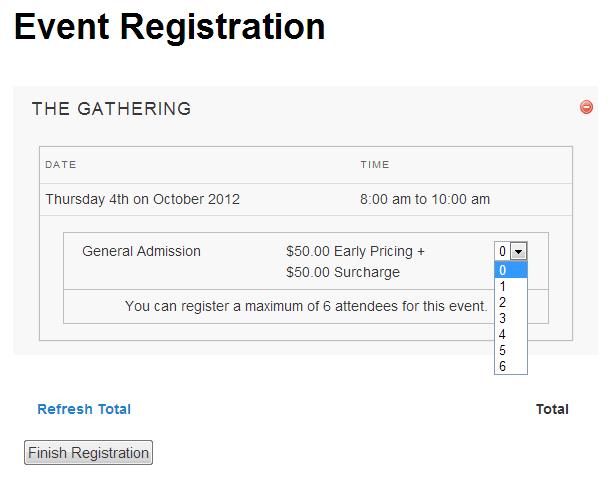 The Multiple Event Registration add-on adds a shopping cart feature on your site. It will allow your attendees/registrants to purchase or register for multiple events with only one checkout process needed! Need to Buy a Support License for the Multiple Event Registration Add-on? Download the latest version of the Multiple Event Registration add-on from your Event Espresso account. You will not see any new WordPress administration menus for the add-on. The Multiple Event Registration add-on will create a shopping cart experience on your site. Your registrants/attendees will be able to add several events to a shopping cart and then complete registration checkout once (instead of once per event). The events on the event listing page will receive an add to cart link as shown in the image above. After adding an item to the cart, your attendees/registrants will be shown the View Cart link on any event in the list that they have added. Clicking the View Cart link link will then take them to the cart confirmation page where they can select the number of tickets / pricing options they want, remove events they no longer want, and proceed to registration checkout. The stop sign (red icon) in the top right corner of each event will remove the event from the shopping cart when clicked. You may notice here that the customer can select multiple amounts of the same type of ticket! This is determined by the Max Group Registrants number in the individual events, so in the case above its set to 6. This can be used to your advantage – by setting numerous pricing options in an event, your customers can buy various ticket types in varying numbers, allowing a greater degree of flexibility for you. Need to collect information from all attendees/registrants? Go to WP-admin –> Event Espresso –> Event Overview. Now locate your event and click on it and you’ll be brought to the event editor. Towards the right area of the screen, you’ll see the Event Options widget. Look for the option for Additional Attendee Registration Info and set it to Full registration information. Then save changes to your event. By default the Multiple Events Registration add-on will not affect single event pages. If you enable the add-on and browse to a single event page, then you’ll still see the registration form. You can change an event to use the shopping cart from the add-on in a few steps. 1) Login to your WordPress dashboard. Then go to Event Espresso –> Events Overview. Locate your event in the list and click on it. 2) You’ll now be viewing the event editor. Towards the right side of the page, you see an area for Event Options. Locate the Display registration form option and set it to No. 3) Add the shortcode below to the end of the event description area. 4) Then save changes to your event. Most of the following shortcodes can be used on a WordPress page or post. Some shortcodes can only be used in the event description area. event_id=1-2-3 (Specify the numeric IDs of the event(s) that should be added (e.g. 1-2-3 will add an event with an ID of 1, an event with an ID of 2, and an event with an ID of 3). This plugin does not create any new menus in the WordPress admin screen. It can be used by adding a shortcode to a WordPress post or post. Please see the documentation in the usage section on this page. I’m seeing a warning above my event pages. Ensure that your Event Espresso software including core plugin and all add-ons are up to date. Then turn off WordPress debugging by changing a macro in your wp-config.php file.